Product #5535 | SKU A15HP | 0.0 (no ratings yet) Thanks for your rating! 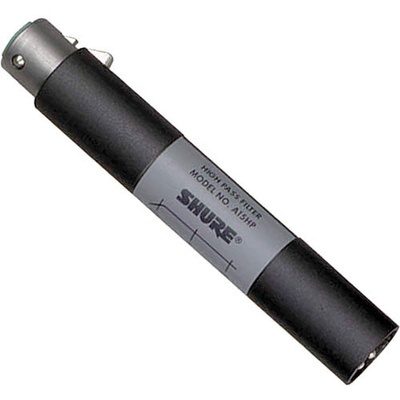 The Shure A15HP Inline filter rolls off low audio frequencies to reduce 60Hz electrical hum, low-frequency wind noise, air conditioner noise, or stand-and floor-transmitted low-frequency vibrations. When loaded with a low-impedance microphone input (800 ohms or more), the rolloff is 12dB per octave below 100Hz. When loaded with 150 ohms, the rolloff is 3dB at 100Hz. The output is flat above the rolloff point (with a maximum loss of 0.5dB at 1kHz). Reduces unwanted low-end rumble in microphone signals.